Although a common cause of intestinal obstruction in children, intussusception is a rare event in the adult population living in temperate regions. It has long been known that various acquired immune deficiency syndrome related conditions of the bowel such as lymphoma, lymphoid hyperplasia, cytomegalovirus colitis and Kaposi's sarcoma can lead to intussusception. The diagnosis is particularly difficult in this population of patients due to the non-specific nature of the symptoms as well as the depressed immune response obscuring inflammation or ischemia. Though the reported acquired immune deficiency syndrome associated cases of intussusception refer to patients with known human immunodeficiency virus infection, in our case we present an intestinal intussusception as the first manifestation of human immunodeficiency virus infection. A 58-year-old white heterosexual Greek man with a clean medical record and no history of abdominal operation presented to the emergency department with symptoms and signs of bowel obstruction. 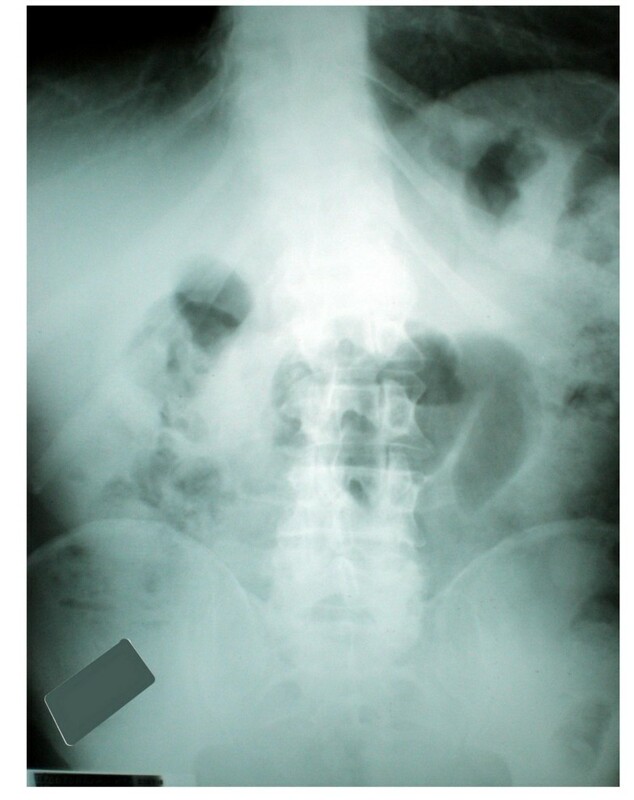 Plain abdominal radiographs were highly suspicious for intussusception which was eventually confirmed on a computed tomography scan. Due to the patients clean medical record as well as the radiologic diagnosis of intussusception, we promptly undertook further serologic tests for human immunodeficiency virus and eventually established the diagnosis of acquired immune deficiency syndrome. The patient was operated 3 days later and this confirmed the diagnosis of small-bowel invagination due to a 4 cm polypoid growing intraluminal tumor, the pathologic examination of which revealed a diffuse high-grade B cell lymphoblastic lymphoma. Human immunodeficiency virus infection may have a silent course and gastrointestinal manifestations of the disease leading to intussusception might be the first clinical sign. Patients with intestinal intussusception, and the presence of risk factors for human immunodeficiency virus infection should be eligible for serologic tests for human immunodeficiency virus infection. Intussusception comes from the Latin intussuscipere which means to take in and refers to a bowel that invaginates upon itself. Though intussusception is a common cause of intestinal obstruction in the pediatric population, it is quite uncommon in adults living in temperate regions, representing fewer than 10% of total causes . Unlike childhood intussusception, which is idiopathic in 90% of cases, adult intussusception has a demonstrable cause in over 90% of cases . An intraluminal tumor, submucosal edema or any process that causes dysrhythmic contractions may initiate intussusception. Colonic intussusception is most commonly caused by a primary carcinoma and benign tumors, including submucosal masses and accounts for the majority of cases of intestinal intussusception . There is growing evidence from the literature associating intussusception with human immunodeficiency virus (HIV) infection [1, 3–8]. Gastrointestinal manifestations of acquired immune deficiency syndrome (AIDS) that may potentially initiate an intussusception include lymphoma, lymphoid hyperplasia, cytomegalovirus (CMV) colitis and Kaposi's sarcoma . We present a case of intestinal intussusception as the first manifestation of HIV infection in a middle-aged man. A 58-year-old, white heterosexual Greek man with a clean medical record and no history of abdominal operation presented to the emergency department with a 2-week history of gradually worsening abdominal pain. Though the patient had been experiencing flatus daily, he reported no bowel movements over the last 5 days. Furthermore, the patient had worsening nausea and vomiting as well as abdominal distention leading to inability to tolerate oral intake. Physical examination revealed a well-nourished, mildly febrile patient (37.5°C). He was hemodynamically stable and his abdomen, though soft, was distended and tender in the hypogastrium and right lower quadrant. No hernia was apparent. Bowel sounds were scarce and rectal examination showed heme-positive stools. Laboratory tests revealed a peripheral leukocyte count of 4080/μl with a normal differential count and a hematocrit of 30%. Electrolytes, liver biochemistry and amylase levels were normal. Plain abdominal radiographs showed multiple air-fluid levels in distended small-bowel loops and air in the colon indicating partial small bowel obstruction (Figure 1). A computed tomography (CT) scan of the abdomen revealed dilated loops of the small intestine and a transition point to decompressed loops at the level of the mid-ileum, as well as a typical 'target sign' of intussusception (Figure 2). Plain abdominal radiograph showing dilated loops of small bowel in the right hemiabdomen and a soft tissue mass. Contrast enhanced abdominal tomography at the level of the umbilicus showing a characteristic 'target mass' (arrows) in the right abdomen. Though serologic tests for HIV infection are not routinely performed in our department for patients with intestinal obstruction, it was our awareness of the association of intussusception with various AIDS-related conditions of the bowel, as well as the patient's clean medical and surgical records that made further screening necessary. Surprisingly, the patient was seropositive for HIV infection and had a cluster of differentiation 4 (CD4) cell count of 274/μl and viral load of 129,000 copies/ml. Laparotomy was performed 3 days later only to confirm the diagnosis of small-bowel invagination due to a 4 cm polypoid growing intraluminal tumor (Figure 3). Pathologic examination of the specimen revealed a diffuse high-grade B cell lymphoblastic lymphoma. The patient had an uneventful recovery and was discharged from hospital on the 6th postoperative day. Resected small bowel segment showing an intraluminal growing mass (arrows) as the underlying reason for the intussusception. Pathologic examination of the specimen revealed a diffuse high-grade B cell lymphoblastic lymphoma. Bowel obstruction is one of the most common complaints driving patients to our emergency department. In the vast majority of cases, a history of previous abdominal operation is revealed making adhesions the leading cause of intestinal obstruction. Other less common causes of intestinal obstruction include incarcerated hernias, malignant disease and inflammatory bowel disease. In cases of intestinal obstruction where the above pathologic conditions are not revealed, it is a real challenge for the surgeon to undertake the diagnosis. Though a common cause of intestinal obstruction in children, intussusception is a rare event in the adult population living in temperate regions, accounting for only 2 to 3 cases per 1 million population reported annually . It has long been known that various AIDS-related conditions of the bowel can lead to intussusception [10, 11]. Nonetheless, the diagnosis is particularly difficult in this population of patients due to the non-specific nature of the symptoms as well as the depressed immune response leading to low leukocyte count and thus obscuring any inflammation or ischemia . Contrast-enhanced CT of the abdomen is the diagnostic tool of choice. Intussusception has a pathognomonic appearance on CT scan, the 'target sign', with a visible appearance of an outer bowel wall circumscribing the inner wall. Additionally, a hypodense area which represents invaginated mesenteric fat is often apparent within the intussusceptum. Intussusception appears to be more common in HIV infected patients due to the increased incidence of pathologic small bowel processes [12, 13]. The interesting feature of our case is that our patient did not have a documented HIV infection. Instead, it was his clean medical record as well as the radiologic diagnosis of intussusception that prompted us to undertake further serologic tests and eventually to establish the diagnosis. We are aware of cases of intussusception in HIV patients reported elsewhere in the literature [1, 4–6, 8, 9]. However, we believe that this is a rare case of silent HIV infection diagnosed via a gastrointestinal manifestation of the disease. Though a rare cause of intestinal obstruction in adults, intussusception has been shown to have a significant correlation with HIV infection because of its association with a variety of infective and neoplastic conditions of the bowel. Apparently, HIV infection may have a silent course and gastrointestinal manifestations of the disease leading to intussusception might be the first clinical sign. Therefore, patients with intestinal intussusception, and the presence of risk factors for HIV infection, should be eligible for serologic tests for HIV infection. In these patients, surgical reduction in the intussusception is well tolerated and is of clear benefit. IK was the major contributor in the conception and design of the study as well as the completion of the operation. SNK and SP collected the data, wrote the paper and were assistants in the operation. SG made substantial contributions to the acquisition and analysis of data, was the attentant physician both during hospitalization and in the follow up visits and CAG was responsible for treatment decisions concerning the patient and he revised the manuscript for important intellectual content, FK gave final approval of the version to be published. Finally, all authors read and approved the final manuscript.